Day 1 of the 2016 Region 5 individual tournament is over and although everything didn’t go quite our way, Blackman still has 8 wrestlers alive in the championship round. 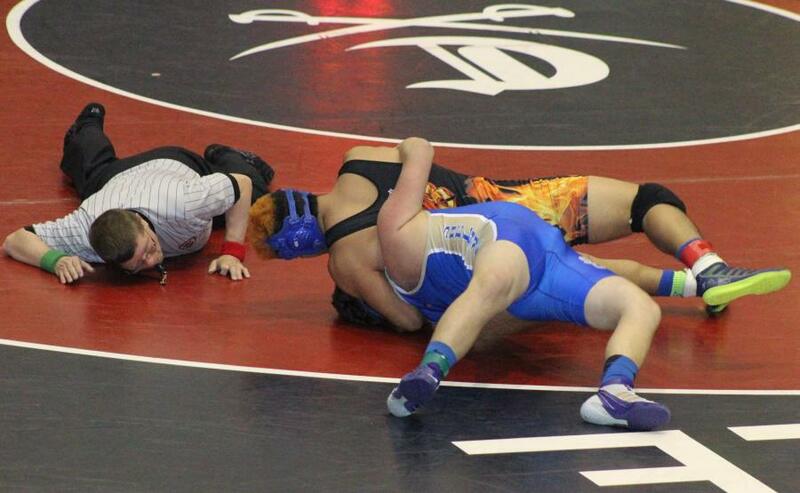 The Blaze currently own third place in the team score with 63 points….. trailing Siegel (77) and Stewarts Creek (88). Before wrestling ever started, Blackman had the disadvantage of having 10 first round byes compared to Siegel and Stewarts Creek who only had 5 each. For all of our non-coaches, having first round byes in a scored tournament is a bad thing. A bye is when a wrestler is allowed to advance in the bracket because there is no one for him to wrestle in that round. If a wrestler has a bye and advances, there are no points earned for that advancement unless he wins the following match. That’s obviously not always an easy task. In this tournament the only way for a wrestler to score points in the championship round if he has a first round bye is for him to make it to the semi-finals. How did we get so many first round byes you ask? Well, it’s a blind draw. Blackman first ended up with eight. After the brackets were drawn, another team scratched some wrestlers which gave us 10. Now,, every team had an equal chance of receiving byes, but the disadvantage Blackman must face is abnormally large. Perhaps next year, the powers that be can devise a way to minimize the damage. RESULTS – In the first round (the one with all the byes) Blackman only had four wrestlers with a match. Jalen Brown(132), Elijah Cox(138), Matthew Sells(160), and Sam Luker(220) all pinned their opponents and advanced to Round 2. The round 2 winners advance to the semi-finals and round 2 is where it gets tough. Blackman had eight wrestlers advanced to the semis. Clayton Apland(126) won a 10-4 decision, Brown(132) got a major, Landon Fowler(145) earned a pin, Sells(160) earned a pin, Vincent Cross(170) pinned, Hunter Winters(182) pinned, Andre Bravo (195) earned a pin, and Sam Luker(220) earned a pin. Tre’von Thomas(120) came up short but had a great match with Smyrna’s young star Cameron Henderson. Tre’von got the first takedown and was up early but Henderson is fierce and battled back. The match ended 3-8. Cole Tillman(152) also had a very close contest with Bos from Cookeville and ended up on the losing end of a hard fought 8-10 decision. Wrestling continues tomorrow at 10am at Cookeville High School. David Moore on Blackman’s Landon Fowler Wins State!